The story of this beer started back in July when I brewed my Seven Blessings imperial rye saison and purchased 2 vials of The Yeast Bay‘s Saison Blend and ended up making a starter with one of them instead of pitching both vials. Then at end of August I looked at the extra vial and saw that it’s best by date was 9/18/14. Being that I wanted make sure to use the yeast and to keep things simple I decided to brew a 3.25 gallon batch of a “Farmhouse Pale Ale” or a hoppy American pale ale fermented with saison yeast. Though by doing so I was left with the dilemma of whether to use my 10 gallon mash tun or to sacrifice efficiency and mash using the “brew in a bag” method. With a 6 lbs grain bill, in the end it was a no brainer to go for brewing in a bag because of the time and effort that I could save on brew day. In order to increase my chances of achieving an acceptable mash efficiency I milled the grains twice. However, once the mash was over and I took a pre boil gravity reading (see video), I realized that I should have set my efficiency target to 70% instead of 72%. In other words, I didn’t hit my target gravity. Then my overoptimism kicked in again as I convinced myself that boiling for 70 minutes instead of 60 would help me make up some of the lost gravity points. This seemingly logical solution was squashed when I took my post boil gravity and saw that I had again not hit my target gravity. So I went back to BeerSmith and realized that I should have started with less water (I started with 5.94 gallons) and taken into account my use of a colander to “lauter” the grains…In the end I wasn’t too bummed because I was shooting for a lower ABV beer anyways, and having just experienced my first over one gallon “brew in a bag” brew day since my first all grain batch in 2009. I learned enough from my mistakes to know what to do differently next time. Recipe Formulation: Having brewed a saison recently I wanted to make sure to use a combination of malts used in both American pale ales and saisons. American Pale Ale: 2-row pale malt, crystal/caramel 20L; Saison: Aromatic, Vienna, White Wheat. For the hops I chose Magnum as a clean bittering hop, Ahtanum as a citrusy yet not to high in AA% flavor and aroma hop, and Galaxy to increase the bold hop flavors stemming from this beers American side. As stated above, I chose the yeast solely based on the fact that I wanted to use it before its best by date. Note: I plan on dry hopping this beer with more Ahtanum and Galaxy hops once primary fermentation ends. If you have any tips on the “brew in a bag” method that you’d like to share feel free to comment below. Cheers! 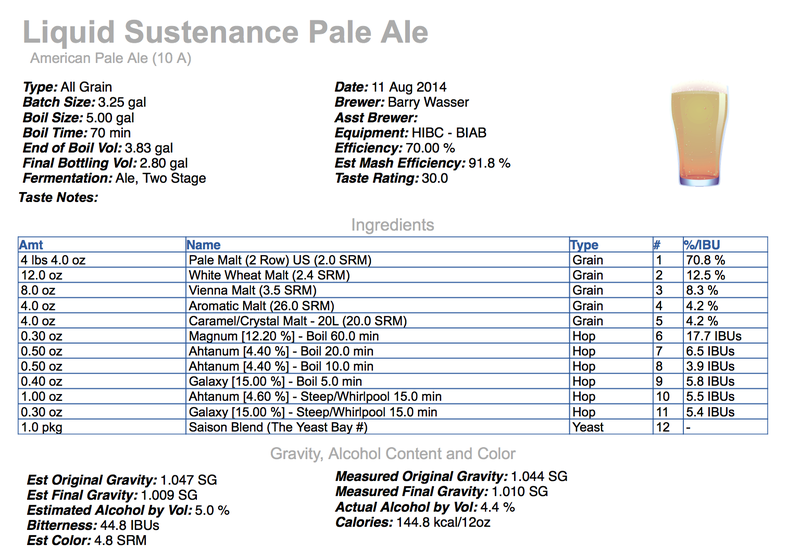 This entry was posted in Brew Day Videos, Homebrewing, Uncategorized and tagged ahtanum hops, All Grain, american pale ale, belgian IPA, brew in a bag, farmhouse IPA, galaxy hops, Homebrewing, saison. Bookmark the permalink. I exclusively use BIAB. There are a couple things that I have done to make up for poor efficiency. I routinely was low on my OGs by 8-10 points. #1: I started setting my brewhouse efficiency at 60% when designing my recipes in Brewers Friend (Beer Smith in your case). This will add additional grain to the recipe to make up for the poor efficiency and still hit the targeted OG. #2: I either mill the grains twice (like you did) or just use a smaller gap setting on the mill. # 3: I extend my mash time from 60 min to 75 min. #4: I do a sparge step after mash which is just slowly pouring 170 F water through the grain bag after lifting it out of the pot to do a final rinse of the grain. As a result, I now routinely overshoot my target OG by about 3 points which is fine by me. My gut feeling is #1 and #4 are the main contributors to the improvements I’ve seen. Keep in mind that if you do a simple sparge, you are no longer doing “full volume” BIAB. You have to reserve some of the full volume to account for sparge water. My rule of thumb is to do at least 1 gallon of sparge. The other advantage of sparging is now I can do 5 gallon BIABs with only a 30 quart pot. Thanks for the tips. I’ll definitely be lowering my brewhouse efficiency next time I brew in a bag and setting aside a gallon of sparge water. For this brew I did a 75 minute mash and milled my grains twice, but overall I have to figure out how much water to start with (including the sparge water) in order to make sure that I don’t start the boil with too much wort. Cheers!